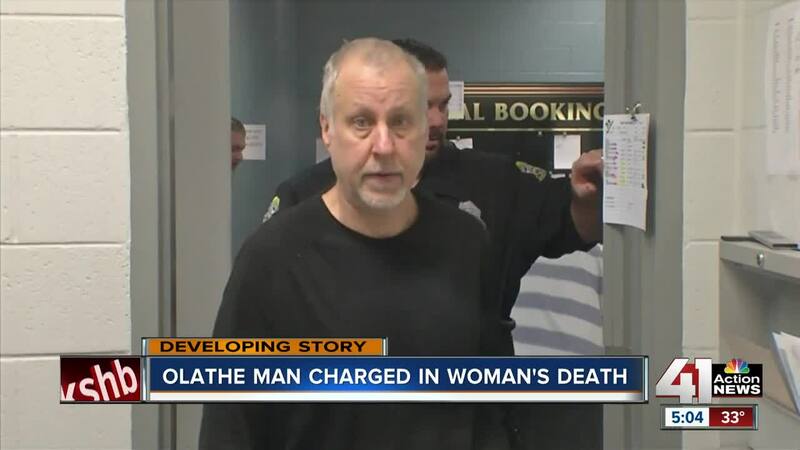 OLATHE, Kan. — The man accused of mistreating and killing an elderly woman, who neighbors said was his mother, made his first court appearance Friday, telling a judge he would hire his own attorney. Raymond McManness, 51, is charged with murder and mistreatment in the death of 75-year-old Sharon McManness at her Olathe home on South Cardinal Drive. Authorities have not said how the two are related, but neighbors said Raymond McManness is Sharon's son. Olathe police responded to the woman's home on Wednesday afternoon. "(Reporting Party) is saying that his mother is in bed and does not think she is alive, medical is en route," a dispatcher said in radio transmissions archived on Broadcastify.com. Paramedics tried to resuscitate her, but she was pronounced dead. Neighbors said the woman had dementia and that Raymond McManness lived with her until he moved out about six months ago. His arrest was the result of an investigation by the Olathe Police Department and Johnson County Crime Lab. District Attorney Steve Howe said that as the aging population grows in Johnson County, he wants to remind the community that there is a hotline to report elder abuse. "Sometimes you'll see situations where personalities will change, memory losses," Howe said. "One of the concerns we have is that if people have dementia or other types of Alzheimer's, those types of attacks on their mental faculties can put them at risk to be victimized in many different ways." Howe said that reporting abuse isn't an option but mandatory, and those who make a call to the hotline can remain anonymous. "It's really important for the community to take care of each other. If you've got a neighbor that you're concerned about, it's OK to reach out and call to make sure that person is OK," Howe said. If you suspect a person who is vulnerable, elderly or disabled is being neglected or mistreated, call the Kansas Protection Report Center at 1-800-922-5330. If it's an emergency, contact your local police department or call 911.